Like jazz itself, Extempore is intelligent, collaborative and inclusive, yet contains that intensity of vision which we associate with the best artists, both creative and interpretive. In format it consists of eight interviews, a number of essays, short stories, poetry, reviews and graphics. It also comes with a bonus CD featuring some of Australia's finest and most innovative musicians. To an outsider, jazz might seem a mysterious, prowling place because it has always defied simple definition, although most people try. Here, Paul Grabowsky thinks of it as both noun and adverb; Sacha Feinstein hears it in the voice of Paul Scofield reading the poetry of T. S. Eliot; Phil Treloar calls it 'collective autonomy'. However we might define it, the music seems to be more about possibilities than probabilities, about risk rather than certainty. The interviews are a strength: thoughtful, intelligent, slow elaborations. The people interviewed take nothing for granted and seem to share a refreshing delight in what they do. What is also interesting to an outsider is that Evans, together with many other artists in this journal, other musical traditions — India, North Africa Indonesia and Turkey — and seeks to collaborate with musicians from those traditions. Among the interviews, Andrew Ford's with Tony Gorman is intelligent and poignant — Gorman has contracted MS, but in 2004 managed to release an album entitled Songs of Hope. For a sense of the joy of simply being able to delight in playing the music you love, I recommend the interview with Shannon Barnett. Peter Newall contributes a fiction piece based upon the song 'I thought about you' (music by Jimmy Van Heusen, lyrics by Johnny Mercer). In it he improvises a tale of love, trains, ambition, loss and music between the phrases of the song. The photographs (Natasha Blankfield and Mark Peterson) and prints (John Ryrie) are about faces and postures: they sweeten the written word. This is a handsome and stylish magazine of which its editor, Miriam Zolin should be mightily proud. 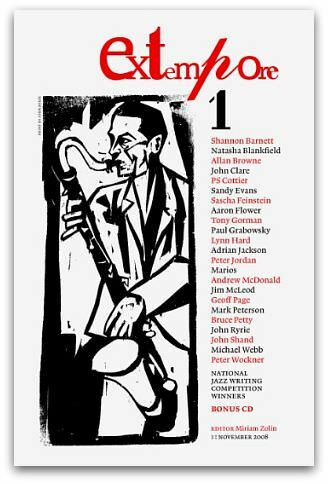 It is a journal for slow reading and I particularly recommend it to those who are not jazz devotees and do not prowl ... yet. To be fair, Walt dislikes everybody. He dismisses the local priest as an 'overeducated 27-year-old virgin' and spews vile, xenophobic slander towards his Hmong refugee neighbours. Walt respects those who can give as good as they get. Obama embraced Christianity because of his involvement with church groups, sustaining the moral vision of oppressed blacks. He has sketched a vision of social renewal that overlaps closely with Catholic and Christian social thought.